Lahore, Punjab Examination Commission has the mandate to conduct the annual exams of 5th and 8th classes every where and judge the educational capability of the candidates through these exams. 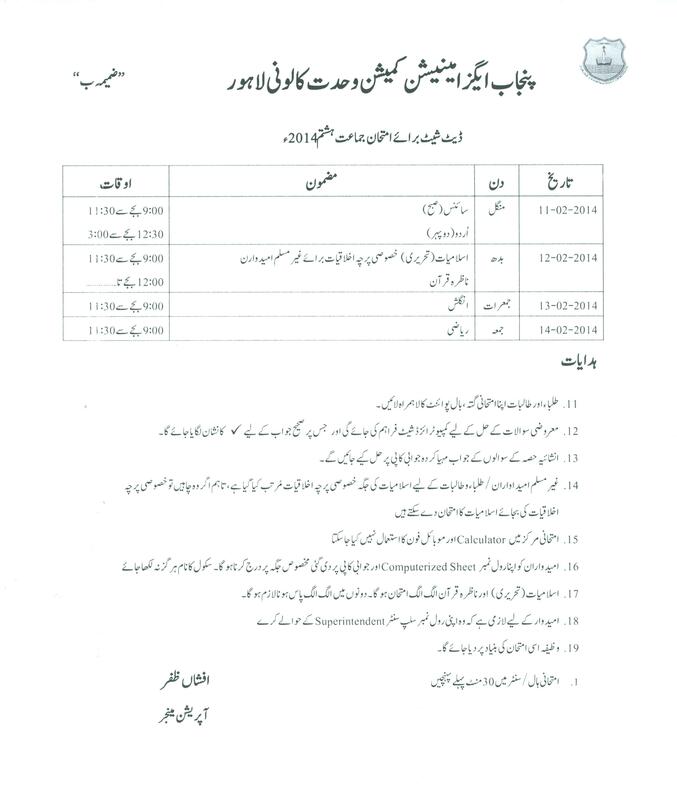 Now PEC is also going to conduct the annual exams of middle class during the month of February 2014 for which they have announced the date sheet of the 8th class. The first paper of Science will be conducted on February 11 in the first shift and the second paper of Urdu will also conduct on the same date in the afternoon time. On 12th February, there will be two papers as the first paper of Islamiat (written) will be conducted in the 1st shift for the Muslim students and the special paper of Ethics will be conducted for the non-Muslim candidates. On the same date of 12 feb, the second paper of Nazra Quran will be conducted and the candidates will have to pass these two exams separately and their marking will also be carried out separately. On 13th February, the paper of English will be conducted in the morning time and the paper of mathematics will be conducted on the 14th February 2014 in the first time. The duration of all papers will be 2:30 hours. The first paper will be started from 09:00 am and it will be continued till 11:30 am. The second paper will be started from 12:30 pm and it will be continued till 03:00 pm. PEC has issued some necessary instructions for the candidates and they should abide by all these instructions. The candidates will bring their own material for writing as there will be no material provided to the students. For the objective papers, the candidates will be provided the computerized sheet on which they choose the correct answers. For the subjective papers, the candidates will be provided the answer sheets. The Non-Muslim candidates can appear in the paper of Ethics and if they like they can also appear in the paper of Islamiat. No candidates will be permitted for the use of mobile handset or the calculator. A specified placed will be given on the computerized sheet and the candidates should not mention the names of their schools. The candidates are allowed to enter the hall before half an hour of the exams. the roll number slips will be handed over to the superintendent of the center and the students will be given the scholarship on the base of this exams result.